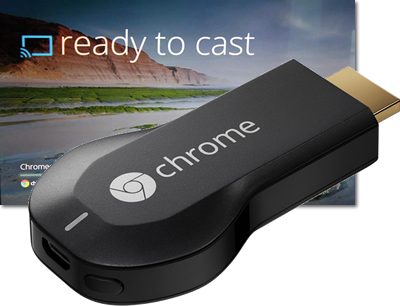 The Google Chromecast has received rave reviews since launching late last year, with the ability to transfer streaming content between devices to their TV screen a popular attraction in particular for its budget price. But one thing that has been missing from the experience is some personalisation or unique features on the system homescreen, though that now looks set to change. As leaked by a user of Reddit, it appears as though a future update to Chromecast will see features such as localised weather news and personal photos integrated onto the main screen. When that will happen (if it does) is unclear, but the Reddit reveal (by user ‘asjmcguire’) came from a discovery within the device’s code, indicating that it is something clearly being considered by Google as a future development. The tiny dongle’s potential development into a powerful streaming device could be an indicator of how much ground a small HDMI/USB plug-in can cover with no need for conventional power or control methods, with a default option of a personalised homescreen (with the generic screen currently only changeable through a download of the ‘MyCastScreen‘) likely to be a key indicator of such potential.